The Lookout at the You Yangs has been closed to climbing for the last 25 years or so. The area was developed in the early 80’s by a number of climbers – David Clarke, Mike Wust, Mark Walters and there is also a route there by Kevin Lindorff. 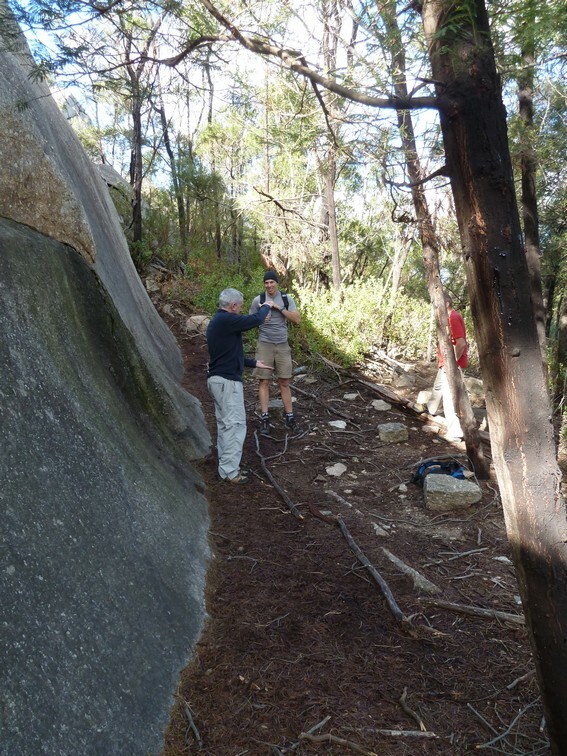 With a good selection of low to mid grade slab climbs, some low beginner routes and a 20 or two to get the heart thumping, it was definitely an area that would have proved to be popular in the You Yangs. With a large selection of higher grade routes in the park, an area that can cater for those climbers learning the ropes of slab climbing whilst providing good routes is a definite plus. Unfortunately, due to a number of reasons, climbing was banned at the Lookout in late 80s. At the time the structure at the Lookout was made of wood and quite old and its placement on the rock was not conducive to the climbers setting their anchors and top ropes from the structure legs. The structure itself was situated more forward than it is now so that climbers were climbing up directly under the Lookout and its visitors. There was also concern at the time that visitors might engage in the activities of the climbers. Times have a-changed though -Following some discussions with Mark Urqhuart, ranger in charge at the You Yangs, the opportunity came up to look at the reasons why the Lookout was banned, its situation then and its situation now. Did it still need to be closed to climbing? Mark and his team at the You Yangs have been making great steps over the years to put the Youies solidly on the map as a great recreational park for a diverse range of users. Amongst the usual recreational visitors such as walkers, nature observers and picnickers, the park plays host to an awesome mountain bike track facility, horse riding trails and of course, our beloved climbing sites. All of these are encouraged, and engagement with the user groups have allowed the care and development of these areas to flourish, with the users taking an active role in site management. The Lookout was eventually rebuilt. Now made of seriously solid steel and sitting a bit further back on the cliff top, the whole structure is a lot more solid than it was in earlier years, and this, along with changing visitor demographic and a modern perspective of user groups and their leisure activities, were the main reasons why the fantastic decision was reached – that the ban on climbing at the Lookout would be lifted. Come July 1st 2013, The Lookout will now be open for climbing. I will be providing route descriptions, access notes and fingers crossed, topos come the next Argus, but to let you know a few of the details. The area will be open to individuals as well as commercial groups. Because of this, there will be four sets of double belays set across the buttress tops. This will provide monitored anchors for the commercial groups and will encourage climbers to use the fixed top protection rather than the structure legs. There will be small signage alerting climbers not to use the structure supports and there will also be some signage on the Lookout above alerting visitors to the fact that climbers are below so as to take care. An access track will be cleared and delineated approx. 8 metres west of the Lookout steps. This has been chosen as it is less steep and less prone to erosion. It then meets up with the small descent gully which will probably require a small amount of stabilization to handle the regular traffic that this area is sure to see. Easy peasy access leads to a really nice flat area at the base which is treed. This will allow small groups of climbers to comfortably climb and relax in the area without too much impact to the surrounding environment. 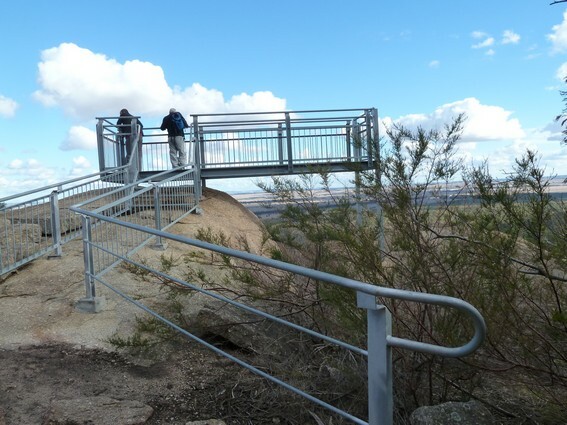 At the lookout area, there is currently a small length of fencing on either side of the steps parallel with the walking track. There will be an extension added onto this to limit access from the immediate lookout area. Where this ends will be the entrance to the climbers access track. With regards to the fixed protection already on the routes, most of this is at least 25 years old, carrots and a variety of mild steel and stainless. After discussions with one of the FA’s of many of the routes, the advice was for all protection to be replaced and with best practice hardware and installation. This will mean that carrot bolts will not be replaced with carrot bolts. At this stage, no retrobolt on the routes is envisaged but there is still discussion occurring to ensure that for the most part, the wishes of the FA as well as present day climbing community is taken on board. I am really excited about this area being reopened for climbing and very encouraged by the people that I have been working with at the park. Good vibes and good times ahead! 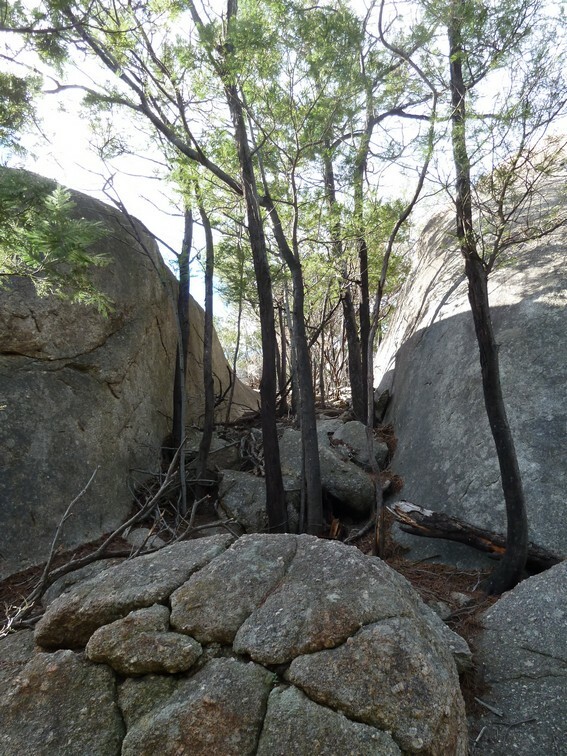 This entry was posted in Access &Environment officer reports, Parks Victoria updates & info, You Yangs and tagged access report, cliffcare, Lookout, parks victoria, reopenings, you yangs by Tracey. Bookmark the permalink. What a fantastic result! Well done to all concerned. It’s great! Looking forward to going there. Thanks for your support Rupert!